ISAW was founded to support research in the ancient world, and publication—in print, online, and in person—is one of the key ways we share our research methodologies and findings with both other scholars and the general public. This page describes some of publications that have been produced by ISAW or under its sponsorship. As outlined in the faculty statement on assessment of research, we aim for quality and long-term accessibility in all our research outputs, regardless of medium, while embracing collaboration and both traditional and new forms of review and assessment. Digital publications are listed separately on our Online Resources page. Other, non-ISAW publications by ISAW affiliates are listed on their individual profiles in the People section. NYU Press, 2013. ISBN13: 978-0814760666. At left: Map 2 (courtesy of the Ancient World Mapping Center). NYU Press, 2012. ISBN13: 978-0814745267. At left: figure 9 from online version of text. NYU Press, 2015. ISBN13: 978-1479880348. This archaeological report provides a comprehensive study of the excavations carried out at House B2, a late third to early fourth century house at Trimithis (Roman Amheida) between 2005 and 2007. The excavations at Amheida in Egypt’s Western Desert, begun in 2001 under the aegis of Columbia University and sponsored by NYU since 2008, are investigating all aspects of social life and material culture at the administrative center of ancient Trimithis. This volume presents and discusses the architecture, artifacts and ecofacts recovered from House B2 in a holistic manner, which has never before been attempted in a full report on the excavation of a Romano-Egyptian house. The primary aim of this volume is to combine an architectural and material-based study with an explicitly contextual and theoretical analysis. In so doing, it develops a methodology and presents a case study of how the rich material remains of Romano-Egyptian houses may be used to investigate the relationship between domestic remains and social identity. 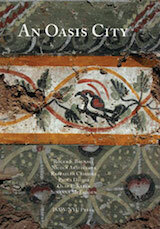 This is the second volume of ostraka from the excavations conducted at the site of Amheida, ancient Trimithis. It adds 491 items to the growing corpus of primary texts from the site. The first installment, Amheida I: Ostraka from Trimithis, contained ostraka from the excavation seasons 2004–2007; the present volume picks up from there through 2013. While the core of the volume is the publication of primary textual evidence, the analytical chapters that precede the catalog make important contributions to understanding the role of ostraka in the life of a Late Roman town. Issues addressed include tenancy, the administration of water, governance, the identification of individuals in the archaeological record, and the uses of personal names. Additionally, the chapter "Ceramic Fabrics and Shapes” by Clementina Caputo is a methodologically rigorous study that investigates the concerns that went into the selection of particular sherds as suitable bearers of text. NYU Press, 2016. ISBN13: 978-1479889228. Exploring relationships between ancient scientific traditions and local Jewish enterprises. NYU Press, 2014. ISBN13: 978-1479823048. At left: Figure 1 from Chapter 2, "Enoch and the Beginnings of Jewish Interest in Natural Science." Princeton University Press, 2011. ISBN13: 978-0691154688. By Roger S. Bagnall, Roberta Casagrande-Kim, Cumhur Tanrever. With a contribution by Burak Yolaçan. Produced for ISAW's Five Year Celebration in May 2012, this book summarizes the people, exhibitions, and initiatives that have made ISAW's first five years in existence such a success. A PDF copy is available for download here. ISAW periodically publishes a print newsletter containing updates on research and teaching. PDF copies are available here for download (requires Adobe Reader or another PDF-capable program). ISAW Papers is an open-content scholarly journal that publishes article-length works on any topic within the scope of ISAW's scholarly research. Learn more. The Journal is devoted to the ancient and medieval cultures of the vast area traversed by the “silk roads.” Stretching from the Iranian world into China and from the Russian steppes to northwestern India, the territory today includes Iran, Afghanistan, Pakistan, India, Turkmenistan, Uzbekistan, Tajikistan, Kazakhstan, Kyrgyzstan, Mongolia and regions within the People’s Republic of China. Edited by Judith A. Lerner, Lilla Russell-Smith, and Sören Stark. Learn more. Princeton University Press, 2010. ISBN13: 978-069114388-0. Princeton University Press, 2011. ISBN13: 978-0691154800. Princeton University Press. ISBN13: 978-1400848867 . Each spring ISAW sponsors a series of four lectures, named after the great ancient historian M. I. Rostovtzeff. Information about past and upcoming speakers and topics is available on the Rostovtzeff Lectures page. Volumes deriving from the series are published by Princeton University Press. Princeton University Press, 2008. ISBN13: 978-0691138565.